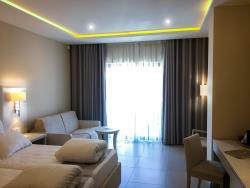 The Maritim Antonine Hotel & Spa is located in the northern town of Mellieha. This small town is the most northern of the villages on the island of Malta and is the last stop before the ferry crossing from Malta to Gozo. The Maritim Antonine is situated at the bottom of the town and therefore enjoys a unique position with no other buildings to the valley side of the hotel. For this reason, the hotel has wonderful views of the terraced valleys which stretch from the lower town right down to Ghadira Bay. The Maritim Antonine Hotel & Spa has a private garden pool to the rear of the hotel which offers absolute peace and tranquility for its guests to enjoy. For the ultimate in peace and relaxation, enjoy a quiet drink in one of the two specially built 'Thai' Gazebos constructed in the garden of this hotel with fabulous views of the valleys. The Maritim Antonine Hotel & Spa has a wide variety of services available to its guests, including three restaurants, two bars, an English style pub, a spa centre, indoor pool and two outdoor pools. This hotel also enjoys a reputation for fine service and is referred to as a superior accommodation in the 4* range of hotels. During the summer, the hotel offers a shuttle bus twice daily to the beach and back. An outdoor pool area set in beautifully tended gardens offers a haven of peace to guests at this hotel. This hotel has various places in which to relax, from the comfortable lounge bar in the reception level of the hotel to the pool garden in the rear of the hotel. For snacks during the day, the hotel has a pizzeria at the road level which opens mid morning and closes late in the evening. Accommodation at the Maritim Antonine Hotel & Spa is a taste of charming comfort and luxury, with all 218 rooms containing over and above the necessary amenities required for a delightful stay in Malta. Rooms are spacious and refined, enjoying picturesque views of the village of Mellieħa, a garden and side sea view, or a distant direct Mediterranean Sea view. Whether you’re seeking a blissful holiday for leisure, or whether you’re a business traveller, Maritim’s accommodation provides an excellent place of refuge to treat yourself to some pampering while also being able to catch up with work at your own desk. The hotel comprises of two buildings connected by a short underground passage, and accommodation is available in both hotel buildings. an en-suite bathroom, which includes a bath tub with hanging shower and toilet. The vast majority of rooms have a balcony for optimum enjoyment of the scenic views. Non-smoking rooms can be specifically requested, subject to availability. WiFi in all the hotel is free of charge. 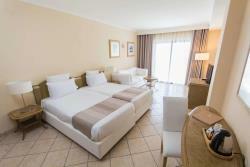 Double or Twin with balcony Rooms offers standard accommodation with elegance. Embellished with warm colors, tile floors and both Mediterranean and modern style furniture, a Comfort Room features two single beds or a double bed on request. Double or Twin with Garden View Rooms offer standard accommodation with elegance. Embellished with warm colours, tile floors and both Mediterranean and modern style furniture, a Comfort Room features two single beds or a double bed on request. These rooms have a view overlooking our garden and/or side sea view. The Junior Suite with Garden view are elegant rooms of a higher category for that extra touch of comfort. From its balcony one can enjoy a charming garden and/or side sea view. These rooms also include a sitting area with a convertible sofa. Family Junior Suite includes a cosy yet substantially-sized bedroom and a sitting area separated by a dividing wall. These rooms feature a marble tiled floor on the sitting side of the room and a wooden floor on the bedroom side. The sitting area includes a convertible sofa and all Prestige Rooms enjoy upgraded soft furnishings and a serene garden view with a side sea view. The Deluxe Double or twin with balcony are elegant rooms of a higher category for that extra touch of comfort. From its balcony one can enjoy a charming village view. The Deluxe Double or twin with garden view are elegant rooms of a higher category for that extra touch of comfort. From its balcony one can enjoy a charming village view. The Deluxe Junior Suite with balcony are one of the new rooms situated on the highest floor, elegant rooms of a higher category for that extra touch of comfort. From its balcony one can enjoy a charming village view overlooking the main street of Mellieha. These rooms also include a sitting area with a convertible sofa. The Deluxe Junior Suite with garden view Rooms are one of the new rooms situated on the highest floor, elegant rooms of a higher category for that extra touch of comfort. From its balcony one can enjoy a charming garden and pool view. These rooms also include a sitting area with a convertible sofa. Deluxe Suite with Hot Tub at the Maritim Antonine Hotel & Spa offers unique facilities in a luxurious setting with excellent views. 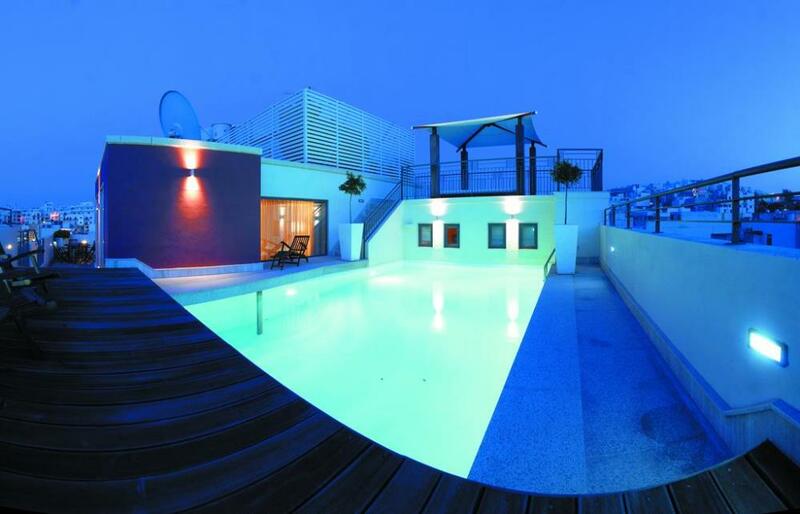 Treat yourself to accommodation at the height of luxury with a stay at the Penthouse Suite with private pool. With lavish furnishings and an edgy, modern design aesthetic, this luxurious suite features superior accommodation with the fullest set of amenities, including a large roof terrace and a private swimming pool. Control over the sound system, curtains and lights of the entire suite and terrace is available at the touch of a button. The heavenly views of the town and the Mediterranean sea can be lapped up from the sizeable terrace, and can even be enjoyed from a canopy-covered sofa on a higher ledge of the terrace itself. The Maritim Antonine Hotel & Spa above all else is renowned for its excellence in cuisine. The main restaurant 'Les Jardins' is located at ground floor level and looks out onto the gardens. Breakfast and dinner are both served in this restaurant. The hotel has a pizzeria restaurant serving everything from snacks through to pasta/pizza and grills. This restaurant is very popular with guests who like an occassional change from their evening buffet meal and for guests on Breakfast basis but who wish to sample fine food at this hotel. Finally 'The Arches' is one of Malta's most renowned restaurants and is the specialality A la Carte restaurant of the Maritim Antonine. This restaurant also boasts an enviable collection of fine wines to choose from. Mellieha Bay - Maltas largest sandy beach. Most recommended beach for childrens bathing. Water depth up to 30 meters from shoreline - 1 metre. Sun beds / sun shades - €3.50 per day. Hotel shuttle bus to beach (summer months). Mellieha was once an isolated 15th century hamlet perched on the ridge overlooking Ghadira Bay. Re-inhabited in the early 18th century, it has since developed into a flourishing town though it retains a quaint historic centre with narrow streets and stepped alleys. 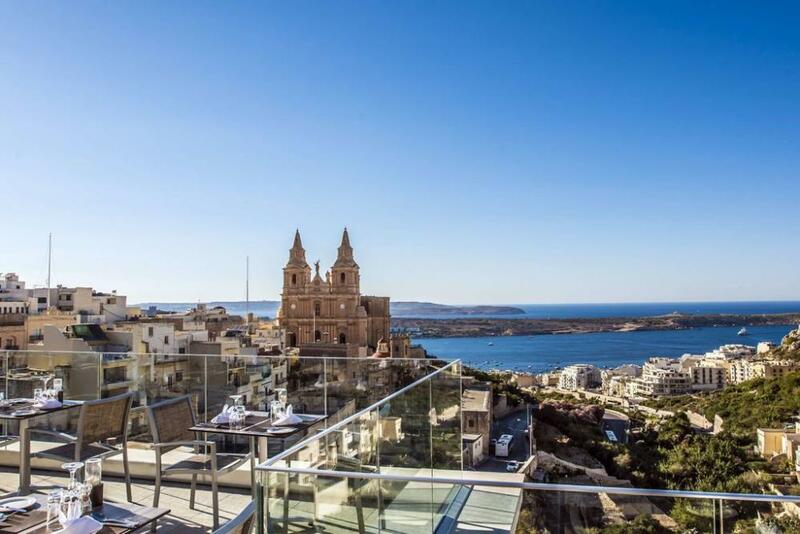 From the terrace of the Parish Church, there is a panoramic view over Mellieha Bay and the surrounding countryside. Mellieha today is a modern town noted for its large private villas and houses which have been built on land overlooking the bay. While the town has developed into a resort, it has managed to retain some of its rural character. 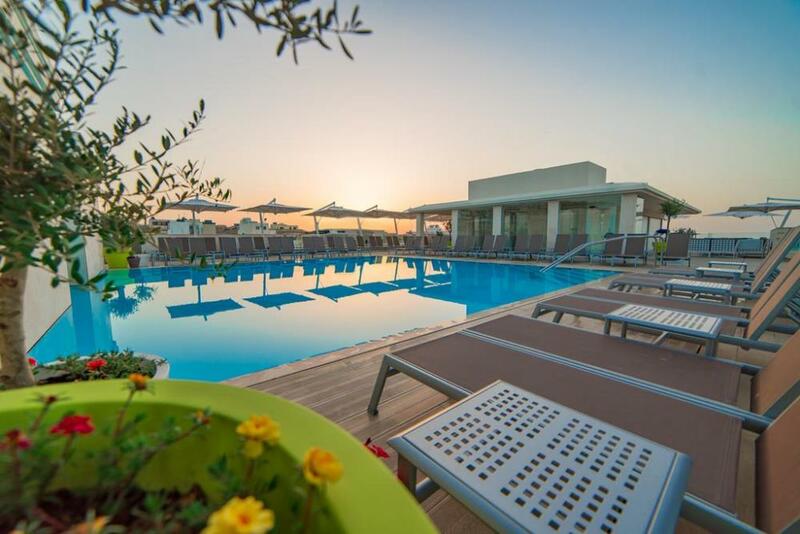 The location of this hotel in relation to the beach at Ghadira bay makes it an ideal choice of accommodation for those wishing to either stay within the hotel complex and relax by the pool or venture outside to the bay. 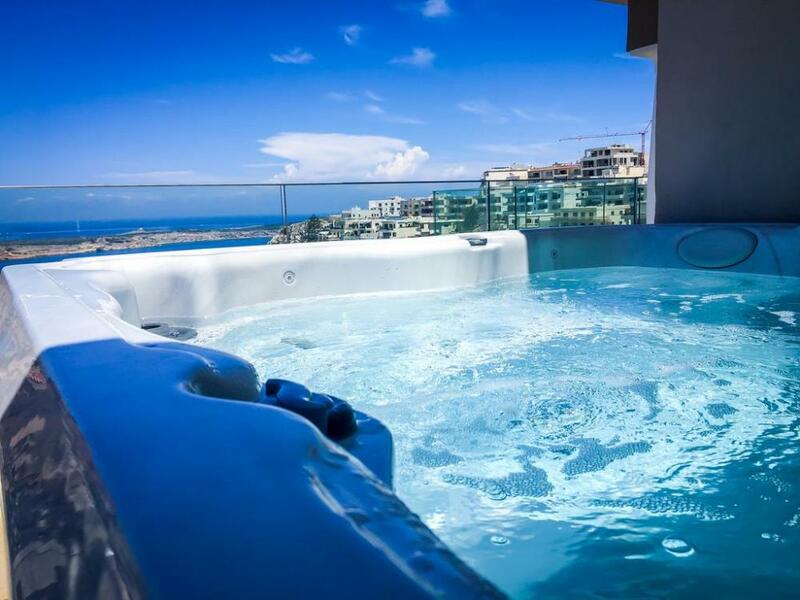 Transport links to most areas of the island can be found within a few metres of this hotel making the Maritim Antonine Hotel & Spa accessible to most other towns and villages in Malta. Mellieha is a swimmers or divers paradise as the waters in the bay are renowned for being extremely shallow and are therefore perfect for families with young children. For a relaxation experience like no other, indulge in a visit to the heavenly Le Spa by Transforma at the Maritim. Treat yourself to exceptional pampering and personalised treatments at this exclusive wellness facility, whether it’s a refreshing workout at the gym followed by an exquisite beauty treatment, or a thoroughly relaxing dip in the hydrotherapy pool accompanied by a detoxifying session in the sauna and steam room. Finish off with a burst of icy freshness in the ice grotto – not for the weak at heart! Le Spa offers a soothing ambiance for the ultimate holistic experience where a wide range of treatments and facilities are available. The hotel also offers the use of three pools: a heated freshwater indoor pool, a rooftop sun terrace pool, and the main outdoor pool situated next to the hotel’s botanical gardens. Bath and shower facilities, changing rooms and locker rooms are also available free of charge. All guests at the Maritim have free use of the fitness room, which is attended to by an instructor. The Ministry of Tourism has confirmed that the implementation of the Eco Tax on Accommodation will become effective on 1st April 2016 (effective date) and will be applicable for all adult guests staying in hotels and other hosted accommodation. The tax will be €0.50 per adult per night, capped at a maximum of €5.00 per adult per stay. The tax will be collected directly by the accommodation service provider prior to check out and remitted to Government. The tax also applies to any accommodation that was reserved before the announcement of the Eco Tax but which will be availed of on or after the effective date. It is our understanding that any reservations that overlap the effective date will be subject to the tax for the portion of the reservation after the effective date. The hotel is at the final stages of renovation, which entails some minor works and final touches to the upper two levels and roof top area as well as the hotel garage. Therefore, at present some areas are still not available. The hotel apologizes for any inconvenience, and will make sure that guest’s holidays are memorable.